Panetta Announces Distinguished Warfare Medal. This new award is causing quite a stir among veterans (see here and here), as it is set to outrank the Bronze Star and Purple Heart in the order of precedence. It is meant to reflect the changes to modern warfare, including the use of drones and cyber warfare. This leads me to raise the question in the poll below. 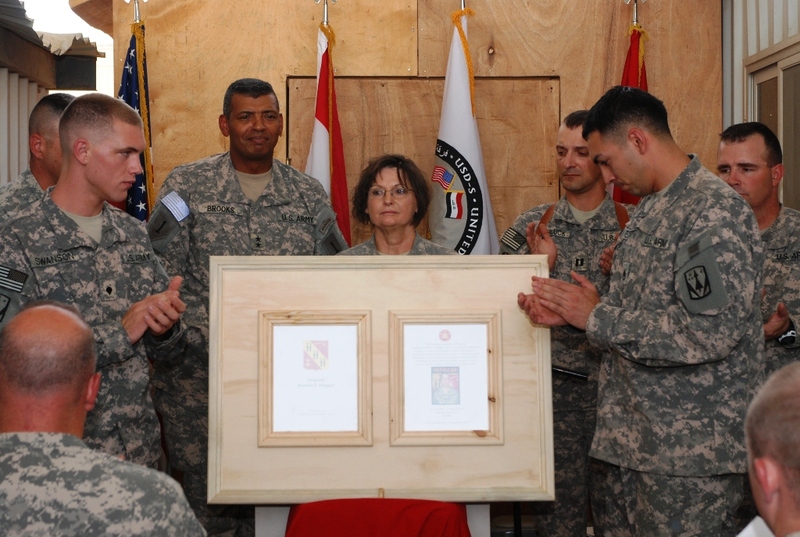 BASRA, Iraq – The new Combat Stress Clinic on the American base at Basra International Airport was named in honor of Sgt. Brandon Maggart in a ceremony Sept. 10. 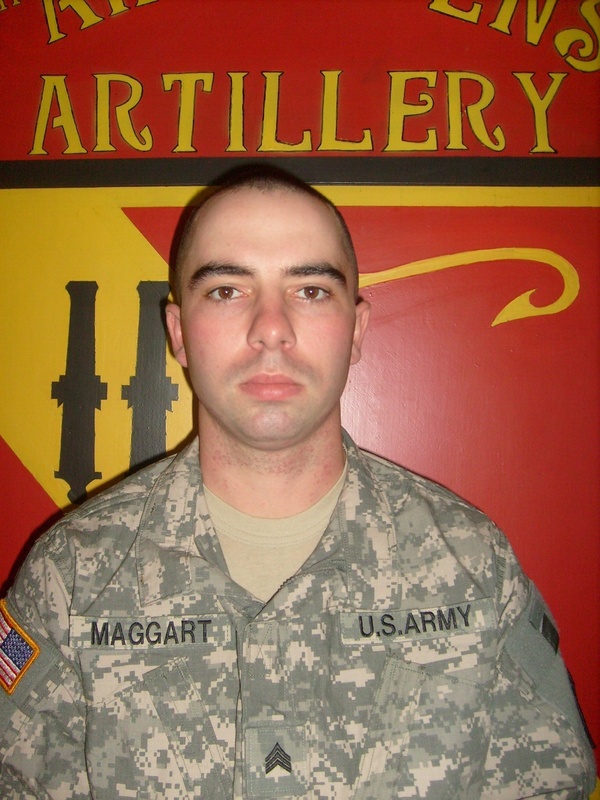 Maggart, who served with Battery A, 5th Battalion, 5th Air Defense Artillery Regiment, was killed in an Aug. 22 rocket attack. The clinic, which was recently refurbished, provides a place for Soldiers to meet with mental health professionals to deal with the stress that comes with operating in a combat zone. Controlling stress is an important part of the military’s overall fitness, and the support center aims to help Soldiers cope. The Combat Stress Clinic renovations, under the direction of Sgt. Sonja Young, a behavioral health technician with the 162nd Area Medical Support Group, were completed the day before the attack. After helping the Soldiers in Maggart’s unit, Young, a San Antonio native, advocated that the new CSC be named after him. Lt. Col. Pamela Breedlove, the commander of the Combat Stress Clinic, said Maggart’s leadership was the reason behind his name being placed on the clinic. Before the renovations, the CSC was an unattractive place for Soldiers to visit. The building would often become too hot inside to be comfortable, and thin walls kept many discussions from being confidential. The building was improved by adding new air conditioning units, increasing the thickness of the walls, and remodeling the inside of the clinic. Sgt. Jose Carrera, a Phoenix native serving as the 1st Inf. Div. 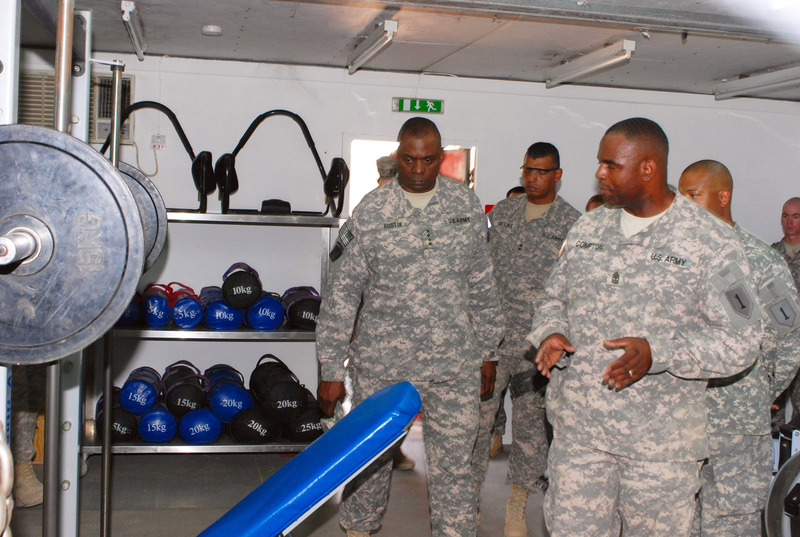 behavioral health NCO, said the improved atmosphere helps Soldiers open up to the staff. Breedlove said the renovations to the clinic help her and her Soldiers do their jobs more effectively. Carrera described the CSC and caring for the needs of the Soldiers under stress as a force multiplier. “When you have Soldiers coming in and are able to receive the treatment they need, they go back to their units and become more resourceful, more effective, and therefore able to carry out the mission,” Carrera said. The clinic is situated across from the Troop Medical Clinic and is open Monday through Friday, from 8:30 a.m. to 4:30 p.m., and Saturday from 8 a.m. to noon. For queries, contact the United States Division – South Public Affairs at USD-S_PAO@iraq.centcom.mil; by phone at (Iraqna) 0790-194-2865 or 770-263-9379. For more USDS news, visit our website: www.dangerforward.us. Courtesy of Captain Tanya Rosa. BASRA, Iraq – One week after assuming command, the senior U.S. Army commander in Iraq visited United States Division-South Sept. 8. Gen. Lloyd Austin, commanding general of United States Forces-Iraq, toured Basra’s business center, the new resiliency campus, and the USD-S headquarters. 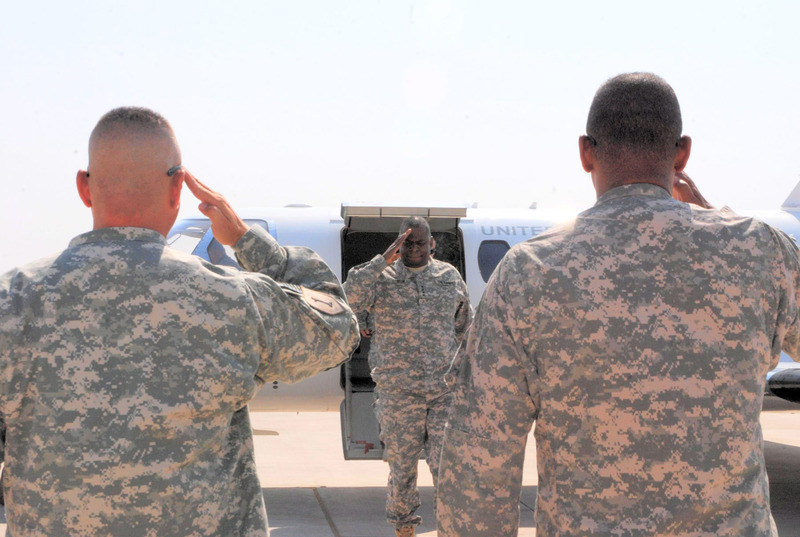 The visit was Austin’s first to Basra since he took command of USF-I on Sept. 1. Maj. Gen. Vincent Brooks, commanding general of USD-S and the 1st Infantry Division, took Austin to the business center where he was briefed by Basra Provincial Reconstruction Team leaders on the economic way ahead for the province. Austin then got a preview of the Basra Resiliency Campus, which is scheduled to open Sept. 9. 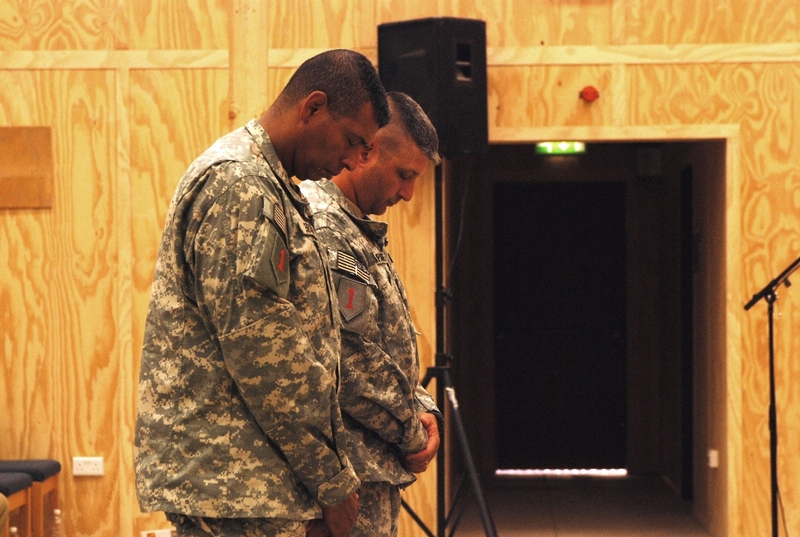 The campus features areas that help Soldiers focus on developing the five pillars of Comprehensive Soldier Fitness: physical, spiritual, emotional, social and Family. After touring the campus, Austin went to the USD-S and 1st Inf. Div. headquarters, where he received an update on operations in southern Iraq, a critical piece of the civil capacity puzzle in Iraq due to its vast oil fields and ports on the Persian Gulf. After the brief, Austin honored 10 USD-S Soldiers by presenting them with coins, an Army tradition for recognizing troops. 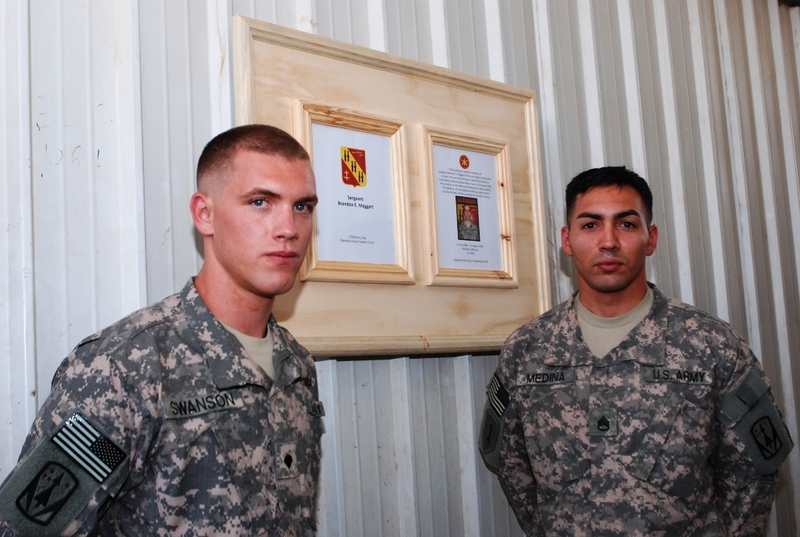 Fallen Soldier honored by unit, friends. BASRA, Iraq – Sgt. Brandon Maggart was sleeping when the sirens went off August 22. Seconds after the warning, a rocket struck the roof of his housing unit on Basra,. Fellow Soldiers of the 5th Battalion, 5th Air Defense Artillery Regiment rushed to his side providing medical aid. He was removed from the room and rushed to the troop medical clinic emergency room. Brandon Edward Maggart, 24, a husband and a father from Liberty, Mo., serving his second deployment as an air defense artilleryman with the 5th Battalion, 5th Air Defense Artillery Regiment, was pronounced dead on arrival. Four days later, a memorial was held for Maggart at the post chapel. Hundreds of people came to say farewell. 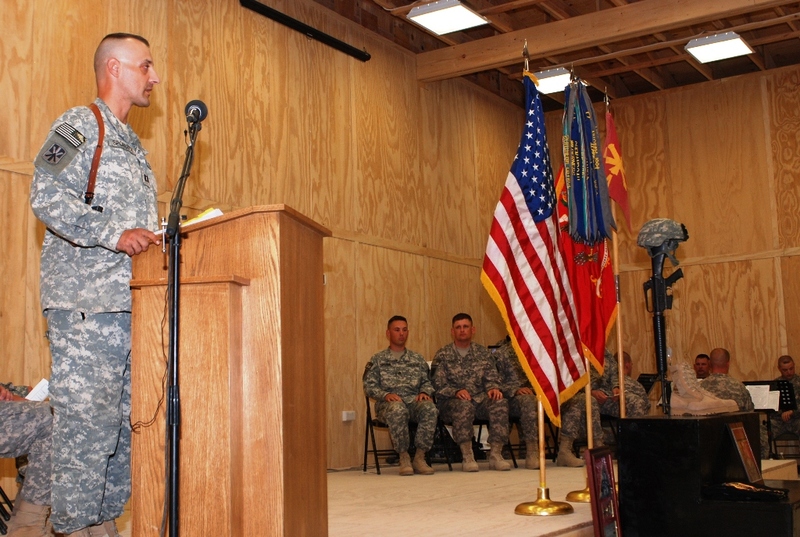 On the stage, his commander, fellow NCOs, and Soldiers stood side-by-side to talk about Maggart. From Capt. 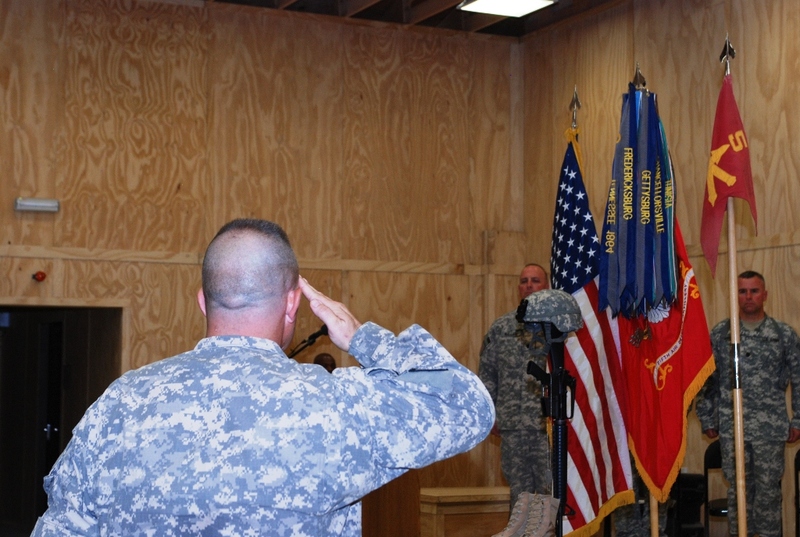 Lloyd Sporluck, commander of Battery A, 5-5 ADA, to Staff Sgt. Simon Cannon, Maggart’s platoon sergeant, the message remained the same: he was a man of character and a person to aspire to be like. Spc. Kandise Phillips, one of Maggart’s Soldiers, remembered her NCO’s contributions. The ceremony continued with a rendition of ‘Amazing Grace’, sung by Chief Warrant Officer Cynthia Choo, liaison with the 201st Battlefield Surveillance Brigade, and Sgt. Shina Richburg, a counter rockets and mortars system operator with the 1st Infantry Division. The end of the ceremony was marked by the last role call, where 1st Sgt. Billy Lingar, senior NCO of Battery A, called the names of the sergeants in attendance. When he reached SGT Maggart’s name, he called three times with no response. Outside the chapel three volleys of a 21-gun salute were fired to mark the passing of Maggart. At the end of the ceremony, each row stood and offered final respects to Maggart. As the line continued, the small memorial stand was soon covered with coins and personal effects as the Soldiers and officers offered tribute to the fallen Soldier. Maggart is survived by his wife, Teresa, and his three year-old son, Blake.